In recent years, several international relations scholars have called on nations to adopt a network model of diplomacy. The term Network Diplomacy often refers to nations’ need to create temporary coalitions in order to achieve their foreign policy goals. Such coalitions may be viewed as networks with each member of the coalition serving as a node. The adoption of the Network Diplomacy model enables nations to cooperate with non-state actors that now influence the diplomatic playing field such as civil society organizations, Non-Governmental Organizations (NGOs) and even netizens. Nations can create networks around specific goals, issues or threats. The coalition currently fighting the ISIS organization in Syria and Iraq can be viewed as s temporary network as can social media campaigns organized by nations to tackle a certain topic. An example of such a network is the TimeToAct campaign against sexual violence in conflict led by the UK Foreign Office. Network Diplomacy is relevant to all levels of diplomacy ranging from multi-lateral organizations (the UN) to foreign ministries, embassies and individual diplomat. One of the world’s major hubs of diplomacy is Geneva which is home to the UN’s second headquarters as well as many of its agencies such as the International Labor Organization, International Telecommunication Union, World Intellectual Property Organization and the World Health Organization. Geneva is also home to other multi-lateral organizations such as the International Organization for Migration and the Inter Parliamentary Union (IPU). Finally, other international organizations also have representation in Geneva such as the World Bank and World Economic Forum. Given the high concentration of international organizations in Geneva it is also home to countless civil society organizations and NGOs all working to achieve international goals by cooperating with the UN and its various bodies. Thus, Geneva may be a network diplomacy hub where nations, NGOs and multi-lateral organizations come together as networks to achieve common objectives. Specifically, The UN HQ in Geneva seems to be a most fitting candidate for Network Diplomacy as each of its agencies/bodies may create networks in different locations to tackle regional and global challenges. Such networks may include embassies to the UN in Geneva, NGOs, International organizations and UN bodies. The UN HQ itself may serve as a promoter of such networks. 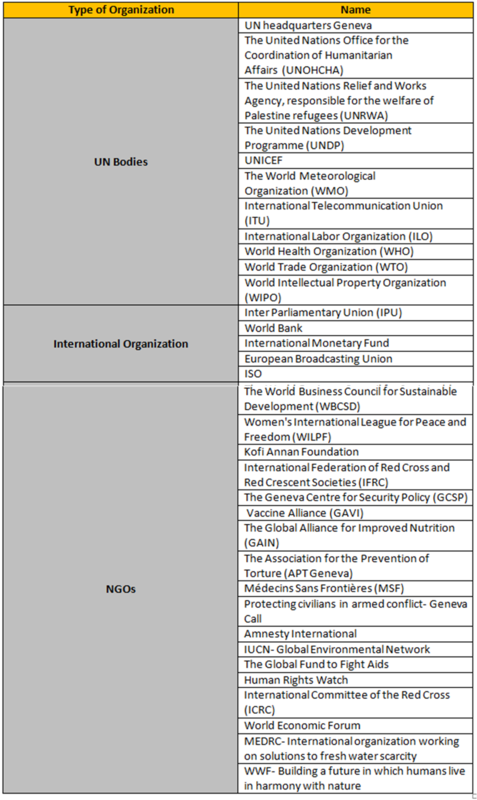 In order to evaluate the degree to which Geneva serves as a center for Network Diplomacy I decided to analyze the social network of UN bodies, international organizations and NGOs operating in Geneva. My goal was not to asses how connected these institutions are. In fact I assumed that such a network would be quite scattered as an NGO dedicated to nature preservation might have tittle interest in following the World Intellectual Property Organization. Rather, my goal was to asses the centrality of the UN headquarters in Geneva in a network of diverse actors. The more central it is, the greater its ability may be to form diverse networks with varying actors. Analyzing the social network of Int’ organization in Geneva, and the centrality of the UN’s HQ, was achieved with a sample comprising the twitter accounts of 37 UN bodies, international organizations and NGOs in Geneva. 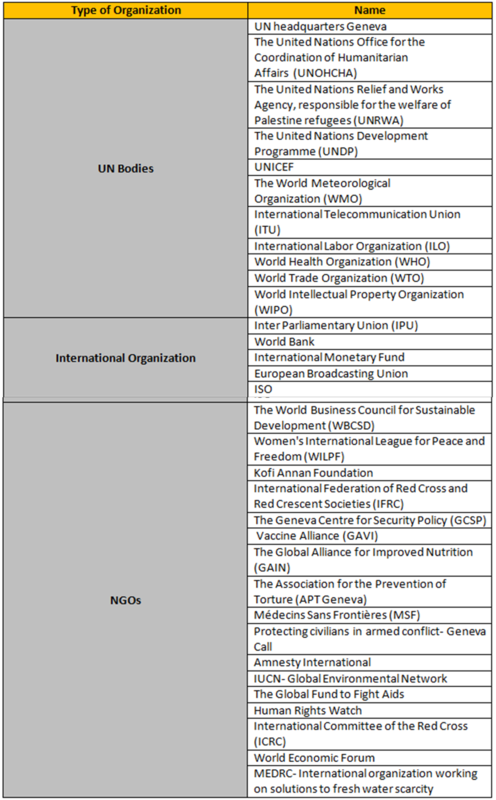 The NGOs incorporated in this sample were those that had a global reach, were headquartered or represented in Geneva and were likely to cooperate with UN agencies. The sample may be viewed in the table below. 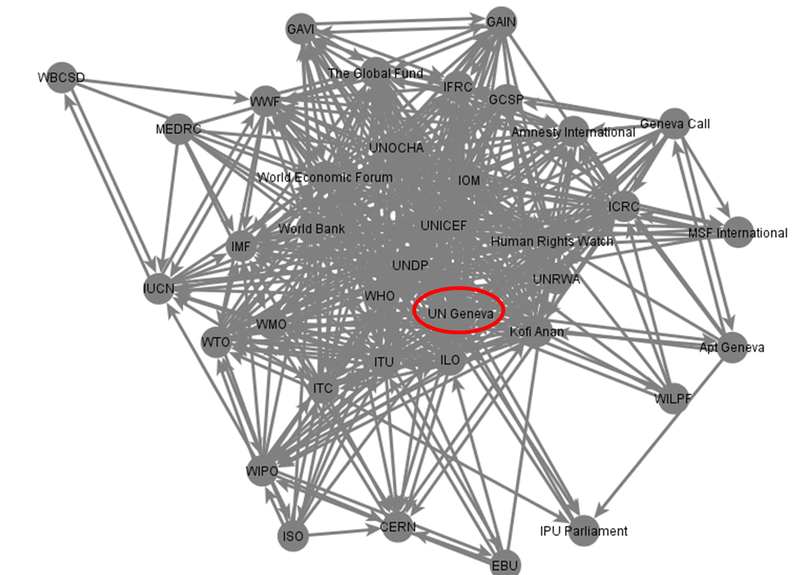 The social network of Int’ Organizations in Geneva can be seen in the image below with the UN HQ circled in Red. As expected this network is rather scattered and has a small core. However, what can be seen quite clearly is the centrality of UN in Geneva headquarters in this network. Moreover, the UN in Geneva HQ ranked high on three parameters evaluated as part of this network analysis. The first parameter, in-degree, calculates the popularity of each member of the network. The second parameter, out-degree, calculates the extent to which each member follows his peer in the network. The third and final parameter, betweenness, calculates which members of the network are major hubs of information as they connect members that do not follow one another directly. 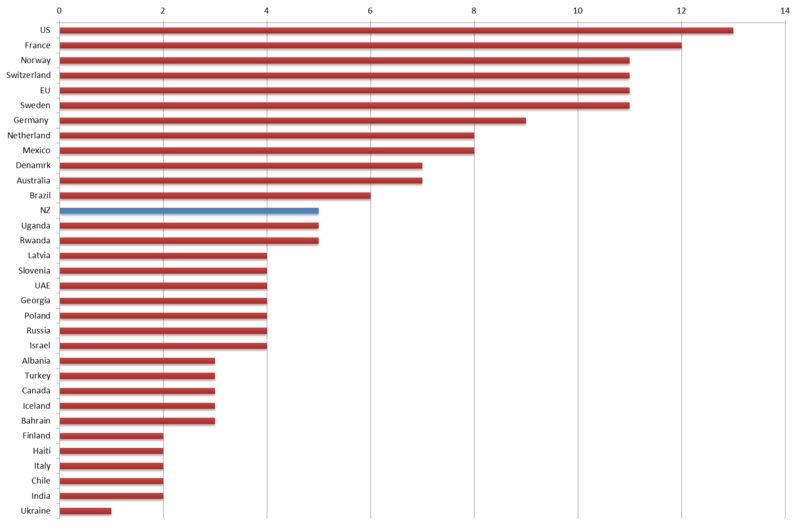 As can be seen in the tables below, the UN’s HQ scored extremely high on all three parameters. Most important is that it received the highest score in the betweenness parameter. Thus, the UN HQ seems to be well connected to Int’ Organizations and NGOs and may be in a prime position to exercise Network Diplomacy. It should be noted, that several NGOs also seem to be well connected in this network, namely the International Committee of the Red Cross (ICRC), World Economic Forum, The Global Fund to Fight Aids and Human Rights Watch. Their centrality may attest to their ability to form networks and promote their specific agendas. Finally, I also examined the number of UN agencies, International Organizations and NGOs following embassies to the UN in Geneva. As stated above, Network Diplomacy may also be exercised by an embassy. The more connected an embassy to NGOs and UN bodies, the greater it ability may be to form action-specific networks formed to achieve specific goals. I thus calculated the number of UN agencies and NGOs following each embassy. As can be seen below, only six embassies to the UN in Geneva attract a sizable number of NGOs, International organizations and UN agencies (they are: US, France, Norway, Switzerland, EU, and Sweden). The average number of NGOs and UN agencies from my sample following an embassy is five (colored in blue), a relatively small number. This does not necessarily mean that embassies to the UN in Geneva don’t or can’t exercise network diplomacy. It could, however, indicate that the conceptual shift from multi-lateral diplomacy to network diplomacy is a prolonged process that has yet to be completed. Posted in Uncategorized and tagged Digital Diplomacy, Geneva, Network Analysis, Network Diplomacy, Twitter, UN, united nations. Bookmark the permalink. Interesting. I used to work in Geneva in pre-Twitter times and I can say it’s true positive networks work have been always present there and now social networks allos to increase efectiveness.